‘If I could have one wish it would be for Jenna’s Truth to save lives. I pray … that one teen somewhere … will come to believe their life matters and that hope exists.’ So writes N. L. King in her explanatory Author’s Motivation. In 2012, 15-year old Amanda Michelle Todd committed suicide after being the target of horrific cyber-bullying. Her story galvanised N.L. King into writing this story of a girl who is cyber-bullied and survives. The book begins with Jenna attempting to drown herself in the diving pool of the local swimming baths. She is saved by a teacher. Jenna then takes us back through the stages that have led to her despair. A quiet, unremarkable girl who wants to fit in, Jenna can’t believe her luck when the popular Tina chooses her as a friend. But all is not as it seems. For no good reason, apart from providing vicious entertainment, Tina plans to shame Jenna. She is invited to a high school party and encouraged to drink until she’s drunk. Pictures of Jenna, half-dressed, in bed with Tina’s boyfriend, are posted on social media. The resulting humiliation almost destroys Jenna. Luckily she has an understanding teacher, a good counsellor and loving parents to help her through. Jenna tells her story in the first 57 pages of this slim volume. The other 23 pages are crammed with useful information about where to go for help, how to report cyberbullying, teaching notes, teaching suggestions, discussion questions and an interview with the author. It has a foreword by suicide survivor Kevin Hines. 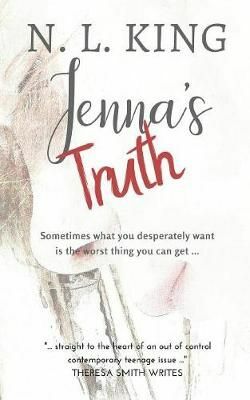 Jenna’s Truth could easily be a way for teachers’ and parents to discuss a number of difficult problems. It is recommended for mature teenagers but I think younger readers will benefit from its wisdom as well. One quibble. Jenna is supposed to take inspiration from the actions of Pi, the fictional hero in Life of Pi. A better choice would have been to reference a book about the bravery and courage of a real person, like Touching the Void or The Librarian of Auschwitz.